Amongst the chaplains who have been wounded are the Bishop of Winchester’s son–the Rev. Neville Talbot–the Rev. Roger Bulstrode and the Rev. A. W. Anderson, B.A. A VICTORIA CROSS CHAPLAIN: The Rev. E. Noel Mellish, who won the coveted Cross for conspicuous bravery at the battle of St. Eloi. At the time of writing only one chaplain has received the V.C.–the second instance since this signal distinction was instituted in 1856. On April 20 the King conferred the Victoria Cross on the Rev. Edward Noel Mellish, temporary chaplain to the forces, for most conspicuous bravery during the heavy fighting at St. Eloi. Quite voluntarily, and outside the scope of his duties, he repeatedly went backwards and forwards on three consecutive days “under continuous and heavy shell and machine-gun fire, between our original trenches and those captured from the enemy in order to tend and rescue wounded men.” On the first day he brought in ten badly wounded men; on the second day twelve more; and on the night of the third day he led a party of volunteers o the trenches to rescue the wounded still remaining. As an indication of the conditions incidental to these brave deeds it should be mentioned that three men were actually killed on the first day while he was dressing their wounds, owing to the murderous fire of the enemy’s machine-guns. Mr. Mellish, who went through the major portion of the Boer War, was prior to becoming a temporary chaplain, curate of St. Paul’s Church, Deptford. Of quite another sort was the act of a chaplain at Loos, who, according to Private Ernest King, of the Northumberland Fusiliers, worked like a Trojan to supply the battalion with ammunition. With resolute courage he did the work of a dozen men, carrying close on fifty boxes of ammunition, one box in each hand, each box weighing six stone, and all the time under terrific rifle and shell fire. Then later the private saw the same chaplain tending the wounded and burying the dead. Several chaplains have been mentioned in dispatches, or obtained distinctions, but, even so, it is certain that many courageous and unselfish acts frequently go unrewarded because the military authorities are unaware of the facts. Amongst those who have gained distinctions there is, for instance, the Rev. D. P. Winnifrith, who went out on August 14, 1914, with the Expeditionary Force, and was present at Mons and at the Marne. The Rev. 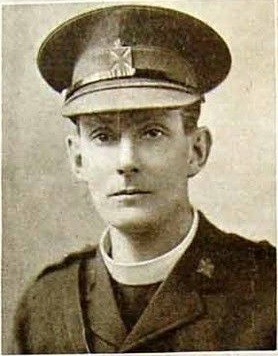 A. V. C. Hordern, who was gazetted for Distinguished Service in the Gallipoli operations by Sir Ian Hamilton, endured the siege of Ladysmith in his capacity as chaplain. The Rev. E. R. Day, M.A., who also served in South Africa and was present at the relief of Ladysmith, has received the C.M.G The Rev. Neville Talbot and the Rev. George Standing, Senior Chaplain of the Untied Army Board, have, with other chaplains, been granted the Military Cross. Another chaplain, the Rev. C. F. G. Holmes, distinguished himself during the shelling of H.M. transport Mercian, when he picked up an unexploded shell which had fallen on the deck and threw it overboard. C.T.B.